Each new MacGillivray collection should be welcomed for its far-out linguistic verve, spiky music and intellectual dynamism. There are few poets writing today as utterly sui generis in their style – like poets of the British Poetry Revival (and I’m thinking particularly of Barry MacSweeney and his Book of Demons) all we can do as readers is surrender ourselves to the aesthetic they have conjured up, and MacGillivray is no exception. Such poetry is at loggerheads with the cool, rational and reasoned tones of reviewers who try to tackle it. I drank my lover’s blood. Spirtle of fire! Spirtle of blood! I vanquish bloods at the weeping of bloods! The answer is that the language is still in a slow, managed decline, despite the best efforts of teachers and campaigners. All of this, of course, is far from lost on MacGillivray; in fact, it is in this uncanny double world that her voice thrives. In the notes to ‘Eadha – Aspen’, she explains that in old Gaelic tradition, death meant a ‘ceilidh’ and birth a ‘wake’ – that death was to be celebrated and birth, and the ‘life of woe’ it entailed, was to be mourned. so suicides will come down to drink. In the notes we are told that a traditional cure for epilepsy was a drink of water from the skull of a suicide, and thus MacGillivray here has inverted things in a very, perversely, life-affirmative way. Indeed, in her striking essay on these themes – ‘Retro-Cognition’ – she compares the thanatic, death-in-life tropes of Gaelic poetry with a saying from the Sanskrit: ‘para desa’. This means the ‘highlands [like the desert] in which [Gaelic can] co-walk itself as both living and dead’. Anyone who writes of this arboreal poetry and language as ‘a point of debate [as to] whether poetic trees invoked are felled or seeded when pronounced’ is very much worthy of our attention. to exorcise a recurring dream set in St. Giles Cathedral, Edinburgh, in which I seem to approach the event of her execution among terrifying tombs and up a large oak staircase. In the dream I navigate towards the death chamber, mounting the long flight of heavy wooden stairs, but of course never reach the top. After chawing up the sonnet manuscript, I reconstructed the second sequence from the tattered, masticated pellets, laying them out to dry and allowed them to determine and suggest the form and imagery of ‘The Blade’. cherry red tears pollinate my queene, bee. the touch of mind’s eye, in the taste of the scent. I hold my head high, preserving their horror. This closing book of the collection is both cri de coeur and chant du cygne, but like the first section on trees in the Gaelic language and imagination, there is a strong element of necromancy. There is the idea that something long dead is being brought to life once more and it isn’t the gory execution that matters. Mary, Queen of Scots here is not being presented primarily as martyr or victim, but a vivid ‘belle rebelle’. Like in the ‘Gaelic Garden of the Dead’ section, life walks arm-in-arm with death, the old Arcadian idea being that in the midst of the idyll there is also death, but this can also be inverted to mean that at the point of death, life can flourish most forcefully. 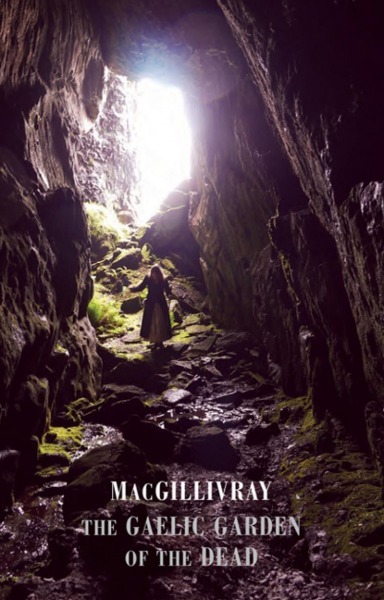 MacGillivray’s is a signal voice and style in a poetry scene where many other voices simply prefer to harmonise and blend in. Her work is certainly difficult but like most modernist or even postmodern writers, the aesthetic goal and pleasure is to be found in the process of understanding and coming to terms with what is given to us by the poet and by the interexts and connections this creates. Here, MacGillivray reaps a remarkable yield in The Gaelic Garden of the Dead. You can find out more about The Gaelic Garden of the Dead from Bloodaxe. Trees in the burn by John Johnston. This image has been cropped and filtered. Licence.